George Wuerthner wrote this now apt essay over a year ago, published in New West last September, suggesting that should anti-wolf interests succeed in delisting wolves and fail to exercise restraint in killing wolves that it would ultimately backfire. Demographically the country is changing to a more diverse racial, religious and age structure. The majority of Americans who do not hunt only accept hunting if they believe the hunter is killing an animal to eat it. Public support for hunting declines rapidly if hunters kill animals for trophy mounts. When it comes to shooting an animal just to kill it as would be the case for hunters shooting wolves—and/or worse as a matter of vindication as in predator control, public support turns to public opposition. Similarly, without the ESA ‘hook’ extending legal protection for wolves, some of the last, best remaining legal angles to protect wolves will be in preventing conflict with livestock on public lands that is ultimately responsible for government trapping and slaughter of entire packs of wolves. Increased public scrutiny over public lands ranching at the land-use level – demanding that ranchers implement preventative measures as a condition of permit to use public lands to graze cattle and sheep is one tangible avenue wolf-advocates might pursue to accomplish wolf protections. One thing is for sure – if wolves are to persist on the landscape in the ecologically relevant numbers that advocates have been promoting for years, outrage over the wanton slaughter of wolves must be felt by those responsible. On February 28, 2011 Chief Judge B. Lynn Winmill of the United States District Court for Idaho agreed with Western Watersheds Project and reimposed an injunction stopping livestock grazing on 17 grazing allotments covering over 450,000 acres of public land in the Jarbidge Field Office of the Bureau of Land Management in southern Idaho. The allotments closed under this injunction contain some of the most important remaining habitat for sage grouse, California bighorn sheep, the threatened plant species slickspot peppergrass as well as native redband trout, pygmy rabbits and pronghorn antelope. Fee is only $1.35 to graze a calf cow pair for a month. Tucson, Ariz. – After a lengthy delay, five conservation organizations finally received an answer today from the Departments of the Interior and Agriculture concerning the artificially low fee federal agencies charge for livestock grazing on public lands. Claiming higher priorities, both agencies declined to address the outdated grazing fee formula. The government’s response was prompted by a lawsuit filed by Center for Biological Diversity, Western Watersheds Project, WildEarth Guardians, Great Old Broads for Wilderness, and Oregon Natural Desert Association. Conservation organizations submitted a petition in 2005, asking the government to address the grazing fee formula and adjust the fee in order to cover the costs of the federal grazing program, which costs taxpayers at least $115 million dollars annually according to a Government Accountability Office report. Conservationists contend that Americans lose even more in compromised wildlife habitat, water quality, scenic views, and native vegetation. An opportunity like this only comes along every ten years or so. I know a lot of people have been furious for years about the cattle grazing in the Bannock Range immediately west and south of Pocatello, Idaho. Western Watersheds/Portneuf Valley Audubon Society new release on the grazing comment opportunity. Conservation groups want Mink Creek closed to cows. Every ten years or so the Forest Service is supposed to revise its grazing allotment plans. One alternative they have to consider is no grazing. I know a lot of the folks I know here in Pocatello would say, “yes, yes” to reduced or elimination of grazing. There are a few beauty area closed, but about 1200 AUMs graze most of the area from June 1 until Oct. 10 each year (actually until the owners of the cattle bother to pick them up). That only leaves the month of May for an ungrazed experience in this key recreation area on Pocatello’s doorstep. Send to your comments to Ranger Jeff Hammes, Westside Ranger District at this email address: comments-intermtn-caribou-targhee-westside@fs.fed.us. Tell why you are interested, give the information you have about the cows and what you think should be done. The formal name of document being prepared is the Lower Portneuf Grazing EA. I took the photo below of a cow covered with houndstongue stickers on the Pocatello Grazing Allotment in the summer of 2009. 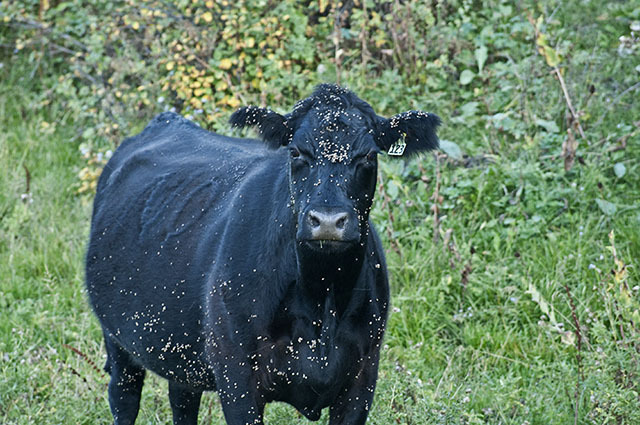 The poor cow’s condition is not unusual, and of course their omnipresence keep the obnoxious weed spreading and spreading. This recognition that wildlife management on public lands ought reflect all Idahoans’ interest, and ought preserve Idaho’s wildlife heritage is threatening to some. To most, it’s just plain common sense. From Keith Allred – I’m sorry to have inappropriately applied the distinction between public and private land to bighorn and domestic sheep questions in recent comments I made to the Sportsman’s Caucus. I’d like to clarify my points and suggest a solution.